This is so incredibly painful to hear. I am so sorry this happened to you! When Morgan and I hear about couples experiencing this sort of pain and really trying to get help but the help they receive is so terrible it makes us want to scream. There is good news here. First, this doesn’t mean that the relationship is completely hopeless or totally over yet. I’ve helped thousands of couples and many of them have already filed for divorce and decided to try one more thing even though they were dead set on divorce. Many times one or both people in the relationship were completely certain they weren’t going to stay married but for some reason ended up in my office. I have even counseled couples where they had been divorced for years and then one day they found each other again and reconnected somehow. 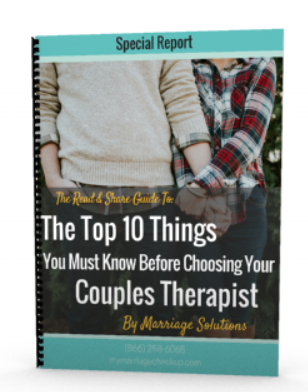 Theses couples usually have tremendous reservations about doing marriage again because of the pain they felt the first time around….but the point is that filing for divorce is not the final say. As you know, we aren’t divorce attorneys, but there are some different options you may choose from. Clearly, if she wants the divorce, and isn’t willing to try again, then maybe you could talk to her about a different arrangement. Maybe one where you don’t divorce but live separately like billionaire Warren Buffet. He and his wife have a lovely agreement where they don’t live together or do life together but they live happily separate. Maybe she noticed how unfair the pastor was in this case. Many times we’ve heard from people in this scenario where the person who wanted to leave recognized that the mediator or counselor was not fair. Something inside told them that it wasn’t a fair shake. Many times it wasn’t too hard to convince them to give it one more try with someone more balanced. Remember, people wanting a divorce aren’t bad people…they’re usually just tired, burnt out, and don’t want to go through the pain and heartache any longer. They aren’t monsters and their hearts aren’t truly made of stone. Some individuals in this situation are able to have a conversation with their spouse that goes like this, “I completely understand why you’d want to leave right now. I haven’t been a very good spouse….or things haven’t been good between us for a long time….I own a lot of blame for that…but I think we owe it to ourselves, to our family, to the life we’ve built to just see if this can be mended. if that is not the right path…telling them that you don’t plan to drag them to counseling to try and convince them to stay. You just want to make sure that you part in the most fair way possible if that’s what they want. You know that you’ll have to be co-parents for the rest of your lives and you want to make sure that there’s no hard feelings between you. Not only that but you will carry baggage with you from this marriage. Divorce alone won’t fix the issues and you will take them with you into the next love relationship you choose. So for the sake of your mental and emotional health counseling is a good idea. Another scenario could be that if you did end up in court appealing to the judge you could tell the judge about how unfair the counseling was and request that you attend counseling from a professional before the divorce is finalized. If you can’t convince her to try real counseling, maybe you could appeal to her logical side by sharing the statistic that while men suffer the most emotionally and socially long term, women suffer the most financially and economically. Read more here. In fact, according to George Mason University Sociology and law professor Lenore Weitzman, a typical woman endures a 73 percent reduction in her standard of living after a divorce. Her typical ex-husband enjoys a 42 percent increased standard of living. You can read more about this here. So, hopefully this helps you. If you have any further questions please feel free to reach out to our office or consider setting a coaching call or private retreat.